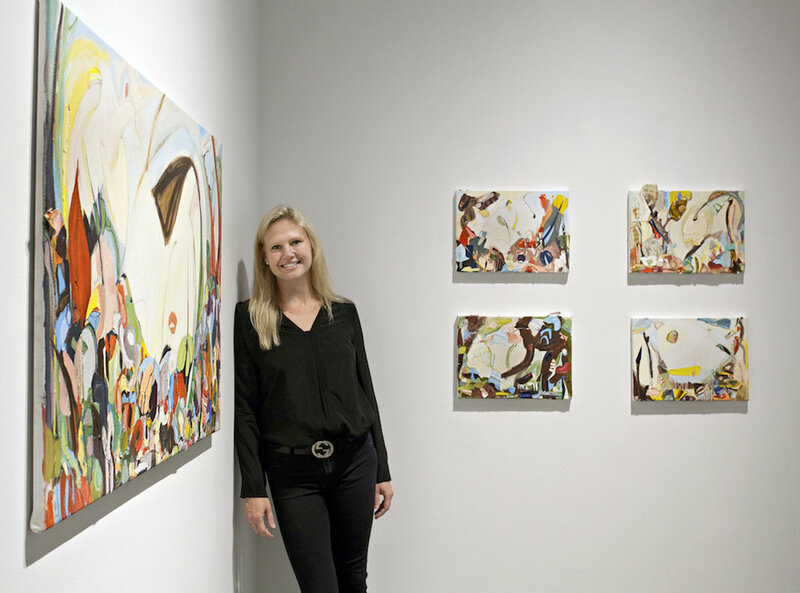 Inspired by her experiences living in Beijing, native Delawarean Monique Rollins will present her exhibition of 22 collage paintings at the Zhu Naizeng Research Center of Art, March 10 through April 25, 2018. For the last two decades, China has proved itself to be a premier contemporary art hub. To knit a West/East cultural exchange, a panel discussion will take place to focus on the role of artistic expression in bridging language and cultural barriers and as a unifier through which the human condition is expressed. It will also look at art as an important conduit to cultural enrichment and preservation, on art as a purveyor to communicate reality, memory, and narrative, and as the medium to celebrate artistic advancement in China and Chinese art in America. Rollins' abstract collage paintings take on an expressive aesthetic appealing to memory, unconscious, and mood. Every gesture, color, line, and biomorphic form predicts the artist's interest in human emotion. 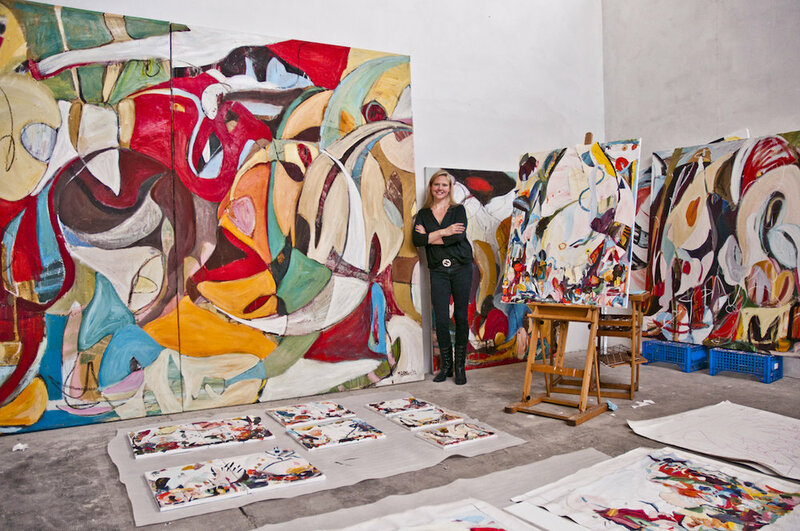 Her distinctive combination of biomorphic and abstracted geometric forms allude to people, places, and events and reveals a profound influence by Abstract Expressionism characterized by expressive lines and shapes. Rollins' work presents an intimate expression of spontaneity and improvisation. A panel discussion will take place at 6 P.M. on Thursday, March 8, at the US Embassy, No. 55 Anjialou Road, SanYuan Qiao, Chaoyang Qu, Beijing (East Gate of the U.S. Embassy), China. Panelists from The Delaware Contemporary in Wilmington, DE (USA) include Kathrine Page, The Gretchen Hupfel Curator of Contemporary Art and Monique Rollins, artist living in Italy. A reception will take place at 3:30 P.M. on Saturday, March 10 at the Zhu Naizeng Research Center of Art, No. 9 South, No. 1 Shuizha Xili, Mentougou District, Beijing, China. Both events are open to the public. Reservation is needed for the panel discussion, please kindly stay updated with the US Embassy official news. As part of the East/West cultural exchange, this exhibition is scheduled to travel to sites across the United States. A native Delawarean, Monique Rollins received her Bachelor of Fine Arts degree from Syracuse University, followed by a Master of Fine Arts degree and Certificate in Museum Studies from Pratt Institute. Rollins continued her studies receiving a Master of Science degree in the History of Art and Design at Pratt Institute. Her work has been selected for numerous solo and group exhibitions internationally, and her work can be seen in corporate collections, such as, the Buccini/Pollin Group, Inc., Wilmington, DE, the Chase Center, Wilmington, DE, the Hercules Building, Wilmington, DE, the Brandywine Building, Wilmington, DE, The Wilmington County Offices, Wilmington, DE, M&T Bank, Wilmington, DE, Hotel Indigo, Fort Myers, FL, and Sangster International Airport, Montego Bay, Jamaica.